I started work on it around a year ago on a whim because I was reading a lot of game design articles and couldn’t resist the idea of a small platform game. It’s really expanded a lot beyond that though! I’d like to start showing it to and discussing it with more people as I continue. The aim of the devlog is to show new exciting things that go in, but also discuss some of my design processes and that kind of thing. Leilani’s Island lavishes attention to its details – watching Leilani roll into an enemy close-up reveals all kinds of design considerations at play, from particle effects to physics. You can just tell that it feels really good to control. This attention to detail is a quality that’s also reflected in the devlog – creator Ishi has been updated the log at least once a week since February, 2015, revealing the game’s influences and evolving design. According to Ishi, Leilani’s Island draws some inspiration from the personality and physics of Wario Land and Donkey Kong Country, but in the animated gifs he’s posted Leilani promises to be even more intricate than the games from either of those series. The artwork, animation, and music (by Leila “Woofle” Wilson) should be at least as good as Nintendo and Rare’s work on those titles. It’s become a joke to talk about Cave Story and Dark Souls when describing other games, but in the case of Momodora: Reverie Under the Moonlight, I’d be remiss not to: the series has never been shy about its influences. 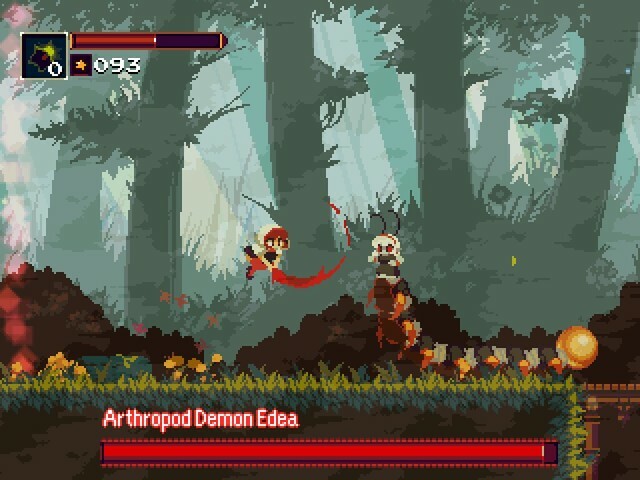 In Reverie, the fourth game of the Momodora series, rdein has done a fantastic job joining the simple charm and tidy aesthetic of Daisuke Amaya’s little masterpiece with the methodical combat mechanics and level design of From Software’s Souls games. The result is something of a “perfect” Metroidvania, which feels neither meandering nor linear, frustrating nor dull. And it’s easy to see why rdein considers this to be his best-looking and most polished game yet: out of all the many beautiful animations and effects in the game, there’s not a single pixel that seems out of place. It’s easy to be wary of high-concept indie titles based around some quirky concept like time travel, gravity, teleportation, guns that shoot science instead of bullets, etc. When they work, of course, they work marvelously, like Portal, Braid, Antichamber, The Swapper, Fez, or any of the best puzzle platformers. But there’s no denying that there is a glut of gimmicky imitators in the genre, and more often than not the concepts, no matter how interesting they sound on paper, are stretched thin across never-ending tutorial levels. So despite Capybara’s strong record it was with some trepidation that I embarked on Super Time Force Ultra, the updated PC version of their time-traveling run n’ gun Super Time Force (which won Microsoft’s first-ever IGF “XBLA Award” for a publishing deal on Xbox 360 and Xbox One). Thankfully, STFU shrugs off the stereotypes quickly and easily, and while the game is certainly unique and innovative, it has the frantic pacing of a good run n’ gun that is not found in most puzzle platformers. On top of that, there is an element of light tactics that strangely enough reminds me of Sega’s 1988 cult classic arcade game Gain Ground. It’s a mad idea that I would not have been brave enough to work on, but I’m happy that Capy was. Indie studio Dopterra has just three days to reach the modest goal of $6000 for its colorful 8-bit title, Creepy Castle. Promising a mix of 2D platform-based exploration and turn-based RPG combat, the game follows the adventure of Moth (note: an actual moth) within the halls of the titular Creepy Castle in an effort to uncover and thwart a looming threat. Dopterra has also teased several other protagonists, playable in an assortment of scenarios that intertwine with Moth’s story. With a graphical style inspired by the Sinclair ZX Spectrum and a catchy chiptune soundtrack, Creepy Castle certainly aims to present a fantastically old-school experience – but its six-person dev team is not afraid to pay homage to the modern indie game scene as well: It’s been revealed that characters from recent indie titles such as Shovel Knight and Super Meat Boy will appear in-game, possibly even in the form of playable characters. With only three days to go in its Kickstarter campaign, Creepy Castle is tantalizingly close to reaching its goal of just $6000. Whether you’ve long dreamt of fluttering your way as a moth through a labyrinthine castle – drawn not to a flame, but to your awaiting destiny – or you simply enjoy old-school graphics and gameplay, Creepy Castle might just be the game for you: Head on over to the Creepy Castle Kickstarter page to learn more and pledge. You can also vote for Creepy Castle right now on its Steam Greenlight page. 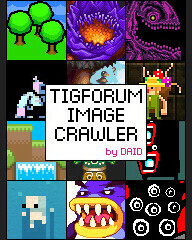 Finally, if you simply want to watch the game as it develops, be sure to check out the Creepy Castle DevLog on TIGForums. Given its immense popularity, fans have been eagerly awaiting a follow-up to Daisuke “Pixel” Amaya’s classic platformer Cave Story. 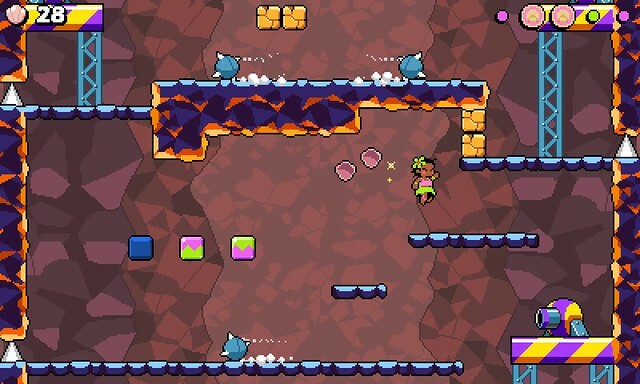 While Kero Blaster isn’t a true sequel, it does have the charming aesthetics, memorable character design, and polish we’ve come to expect from a Pixel game. However, the adventure is also much smaller in scope – playing through two loops of the game will probably only take a few hours. On iOS the game controls decently with an on-screen pad. Instead of a button, shooting is handled with a nifty triangular slider, which makes aiming easier and frees up your thumb for jumping. You can also get the Windows version from Playism, which supports keyboard and gamepads. How to play the game on iPhone without muffling the music, according to Pixel. Kero Blaster probably won’t make a Pixel fan out of anyone who wasn’t already one, and for those who are, it could be a little disappointing due to the small scope. But what is there is quite enjoyable. FourbitFriday’s game Catacomb Kids has just under 5 days left for it’s Kickstarter campaign. The game is a platformer roguelike with a heavy emphasis on the roguelike elements when compared to similar games, with random enchantments on equipment, the ability to chop limbs off of your opponents (or have your own cut off), and deep interactions between objects in the game. Though its reached its goal already, Catacomb Kids is worth checking out if just for the depth shown in the short video above. Night In The Woods is a 2D story-focused adventure/exploration game with many extracurricular activities to enjoy, characters to meet, and secrets to discover. Run, jump and use astral projection to explore the many sides of town of Possum Springs and the surrounding environs. Waste time around town with your crew of loser friends. Gain abilities that grant passage to new areas. Discover the secrets of a large cast of characters and the town itself. Experience a big crazy world and the remarkable events unfolding there. Play bass. Break stuff. Lovely audiovisuals and I’m intrigued by the story and characters. Really looking forward to this one! From the early arcade to the Dreamcast era, Sega had a stable of first and second-party developers regularly producing vibrant genre-defining games, inventing and reinventing convention. Today that experimental spirit has largely died off, or been dialed down into tame sequels and re-releases of classic titles. Amateur developers like the Arcane Kids have stepped in to fill the gap, and now Simon Stalenhag and Tommy Salomonsson (collectively Pixeltruss) have released Ripple Dot Zero, their own game in the free-spirited high flying blue skies style. Ripple Dot Zero is free to play in browser. We spoke with Pixeltruss to discuss the history, release, and future of the project. It’s a long one! Interview past the break. Here’s a guest review for Mercenary Kings. I even made a video to go with it! Mercenary Kings is simply amazing. You can always tell when you like a game – you start playing it and spend the next 8~ hours continuing to play it. It’s that good. When I started out, I did the online co-op with a few friends over a Skype call, playing on my TV with a gamepad for the full experience. Co-op was great, but I kept playing for hours after everyone else left, completely immersed in the level of depth the game had to offer. Let me just say that this game seems to have ticked all the right boxes. It goes without saying that a game featuring the awesome art and animation of Paul Robertson is going to look great, but beyond that it even feels great; the feedback couldn’t be better. The music is also one of the game’s strong points, with driving, energetic tunes that will have you humming along. But as great as it looks, sounds, and plays, I think the most compelling feature of the game is the weapon crafting system. As you play the game, enemies and chests will drop common, uncommon, and rare materials. Back at base camp you can use these to craft weapons, armor, and accessory upgrades. But it isn’t as simple as upgrading your gun to level 2. Perhaps the greatest aspect of Mercenary Kings is that every part of your gun is customizable – the receiver, the barrel, the stock, the magazine, etc. Using this system you can mix and match to create one of thousands of unique possible combinations. The game also features a rank system where you’ll rank up by completing various missions, including scenarios like hostage rescue, scavenger hunts for materials, and simply neutralizing or capturing enemies and bosses. Completing some missions will unlock new NPCs to interact with as well new missions, areas, and weapon parts to craft. If RPG elements aren’t enough to sell a Metal Slug-type game for you, then it’s probably not your cup of tea, but as far as games in this genre go, this one is pretty great and easily one of the best games I’ve played so far in 2013. For fans of the Contra and Metal Slug series who also enjoy high-level weapon customization and RPG elements, this game is most certainly a must buy.